An article yesterday in The Conversation called "'Biggest Loser' policy on literacy will not deliver long-term gains" has urged caution at the government's $22 million for Direct Instruction in remote Aboriginal communities. Stewart Riddle from the University of Southern Queensland writes that the Federal government can't expect to axe the Gonski education funding model and indigenous community health and education programs, "and then turn around and claim that a sparkly new program will somehow 'fix' Indigenous literacy." Well, I agree, I'm angry about the big cuts too. But I think the Direct Instruction funding is probably a good thing, and is likely to give the Aboriginal kids involved a good start on literacy. No, it won't fix all the problems, but the muddled approach Riddle recommends is more likely to leave them simply unable to get words on and off the page. Riddle argues that the Direct Instruction program that has received the $22m funding is about "skilling and drilling students to the point of exhaustion, in order to get the most visible results possible (i.e. increased NAPLAN scores) in the shortest time". He doesn't cite any evidence to support this controversial statement, or explain exactly what other sorts of results might be more desirable than fast improvements on national literacy test scores. He argues that other things are probably more important than test scores. Well, that's true. The ability to read and spell the things you want to read and spell in your real, actual life is of course more important than your NAPLAN score. But if you want to find the kids who can't read and spell the things they want to read and spell in their real, actual lives, a good place to start looking is among the kids with low NAPLAN scores. I've met a lot of them. They are not very happy. Riddle doesn't suggest a better, practical measuring tool. What is direct and explicit instruction? Riddle might have formed his "skill and drill" view of DI after viewing some of the many DI-in-action videos on YouTube. These tend to show children sitting in rows, facing the teacher, as the teacher leads a tight, highly-scripted, call-and-response type lesson, with children all on the same page, all pencils down, all hands up, or doing things like reading in chorus. That's not how we do education in Australia! Children sit round tables, and learn by exploring and playing at their own level. Children shouldn't be expected to march to the teacher's drum! A teacher is just the facilitator of child-centred learning. When you're socialised to believe this, DI classrooms don't look appealing. B) going into a mainstream classroom where a nice, collaborative, friendly teacher will encourage you to attempt books and writing tasks that are simply too hard for you, explore multiple and digital literacies, have fun, be praised for trying your best and kept home during NAPLAN testing, and continue to see little more than black squiggles on the page. No contest, right? Like everyone else who understands this issue, I'm keeping a sharp eye out for option C, combining the academic rigour of option A and the fun and child-centredness of option B, but in a classroom of one teacher and 25 children, and a lot of material to get through, that's quite hard to do. Anyway, children like learning for its own sake, and strugglers are often the first to understand the difference between good teaching that helps them really make progress and edutainment. To get 25 children to do the amount of work necessary for all of them to learn to read and spell is a big job, and the teacher has to be very organised. She or he has to teach in steps small enough that nobody falls down between them and gaps don't open up to the point where there are really two or three or six different levels requiring different teaching in the same grade. Mainstream Grade 2 classes typically include children who can read just about anything, and children who can hardly read anything. The task of teaching a single lesson on any topic to the whole group has been made well-nigh impossible. I'm slightly amazed that anyone wants to be a Grade 2 teacher. Later on, some of the strugglers catch up because of intervention organised by their families or the school, and the ones that don't are given an IEP and their separate program is acknowledged and formalised. But Grade 2 is all over the place without really acknowledging this properly, especially when children come from a broad socioeconomic catchment. The language of the expression "skilling and drilling to the point of exhaustion" is also very interesting, I think. We encourage children who love and seek to excel at sport to practice, practice, practice. Then go back and practice some more. Is that skilling and drilling them to the point of exhaustion? Should children like the young Nick Kyrgios really be using those dreadful machines that throw 100 tennis balls at you? Should any primary school child spend hours practicing shooting goals? Aren't sports first and foremost about having fun? Why aren't there lead articles in The Conversation obejcting to children around the country doing exhausting sport skilling and drilling? As a society, we understand that high sports performance requires mastery of certain skills, and that requires lots of repetitive practice. 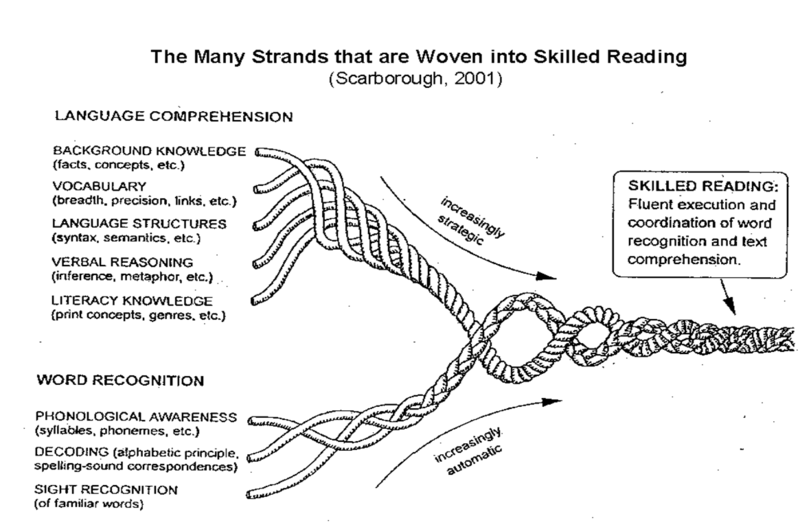 The top strands – learning language, including language comprehension – are natural, developmental processes. Our brains are wired to learn language, unless we have language impairment, acquired brain injury, intellectual disability or a similar problem. Language skills are expanded and refined in literacy tasks but most children arrive at school with lots of background knowledge, vocabulary, grammar, verbal reasoning and experience with printed materials, particularly children whose families facilitate this learning by talking and reading to them a lot. There's nothing natural or developmental about word recognition. It's a skilled, learnt behaviour, and does have to be taught from scratch, though many parents and grandparents now do this before a child starts school, thus presenting the six-different-levels-in-the-same-grade problem to teachers of five-year-olds, sigh. Word recognition is made up of three strands – phonological awareness, decoding and sight recognition – and at the moment most university Education faculties seem to pay very little attention to the first two strands. This leaves teachers encouraging children to memorise the 100 most frequent words, look at the picture and guess, learn the "sounds of letters" of the alphabet (but only at word beginnings) and a few rather randomly selected digraphs (sh, ch, th, oo, ee, ai, ou, "magic e"), then hope for the best. The one in five children who struggle are then referred for extra intervention. Often they are left to struggle for a whole year before anyone intervenes. When I ask teachers how many vowel sounds (sounds, not letters) there are in English, the answer they reliably give me is "five". There are 20 vowel sounds in spoken English (for the purposes of spelling. We're not having a highfalutin conversation about diphthongs and triphthongs here). These are spelt over 200 ways. Most teachers seem to have never been taught what the sounds of our language are, let alone how to teach at least all their major spellings in a systematic way. I want literacy education lecturers like Stewart Riddle to pay less attention to whether literacy is a singular or plural noun, and more attention to this. Aboriginal children are about two-and-a-half years behind on literacy, according to the national literacy test, NAPLAN. Almost bizarrely, Stewart Riddle argues that perhaps trying to close the gap between indigenous and other children is assimilationist. "What relevance does sitting for the NAPLAN tests have for a young child, living in a largely oral-language culture in remote communities, where English may be their third or fourth language?" Well, I'm sorry. I've sat on the ground with Aboriginal women and children in the Northern Territory, where they lived in tin huts with no running water, and English was their fourth or fifth language. I've hung out with indigenous people in the inner city. A couple of weeks ago at school a little indigenous boy was nagging me to include him in one of my groups (I have). In Grade 2 I sat with the daughter of the local Aboriginal elder, I still have the snailmail letters we exchanged for years after she moved away. Don't tell me that Aboriginal kids don't want to be able to read and spell in English, and access the same opportunities as everyone else. Don't tell me their parents don't mind that their scores are two-and-a-half-years behind on NAPLAN. I find it offensive. Riddle's favoured "balanced approach" to literacy in my experience leaves children with weak phonemic awareness (and a lot of Aboriginal kids have early conductive hearing problems, which don't help their speech-language development) totally confused. I think "balanced literacy" should be called "literacy chaos". Direct instruction is the opposite. Siegfried Engelmann, the founder of Direct Instruction, says the aim is to teach in tiny, crystal-clear steps, and eliminate tough spots and confusion. He says "If you arrange your challenges so that they always succeed, they are going to learn the general rule that they can always exceed the teacher' expectations. And if they can do that, they must be pretty smart huckleberries, right? And that's how they feel". Pretty smart huckleberries, I'm definitely going to use that expression. I don't use Direct Instruction programs myself for the reasons I outlined in this previous blog post, I generally use my own materials plus a range of other published synthetic phonics materials. However, I am very clear about what my target skills are in every session, and we work in tiny steps with lots of practice-to-automaticity. So the approach is a lot like Direct Instruction for reading and spelling. Direct Instruction is a vastly better instructional system for teaching struggling readers/spellers than Balanced Literacy. By "better" I don't mean semiotically and politically more pleasing, but that it makes more sense theoretically, and it has measurably better outcomes, using valid skill measurement tools and properly controlled and replicable research designs. No, throwing a few million at Direct Instruction for remote Aboriginal communities doesn't make me like Federal Education Minister Christopher Pyne or his government's wider agenda, but even a broken clock is right twice a day. This entry was posted in curricula, funding, literacy problems, research, teaching strategies, Uncategorized on July 3, 2014 by alison.